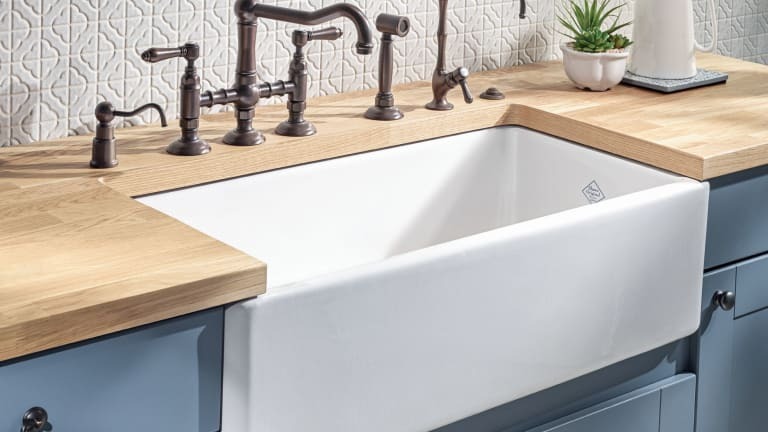 Solid ceramics, the ne plus ultra in sinks and lavatories a century ago, are still made for utility and beauty in period kitchens and baths. 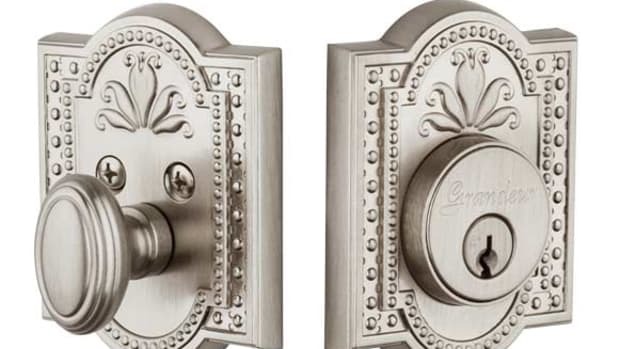 Kitchen and bath fixtures for most people mean the shine and splash of faucets, spouts, and shower heads, but in period-style houses the creativity and beauty doesn’t stop there. 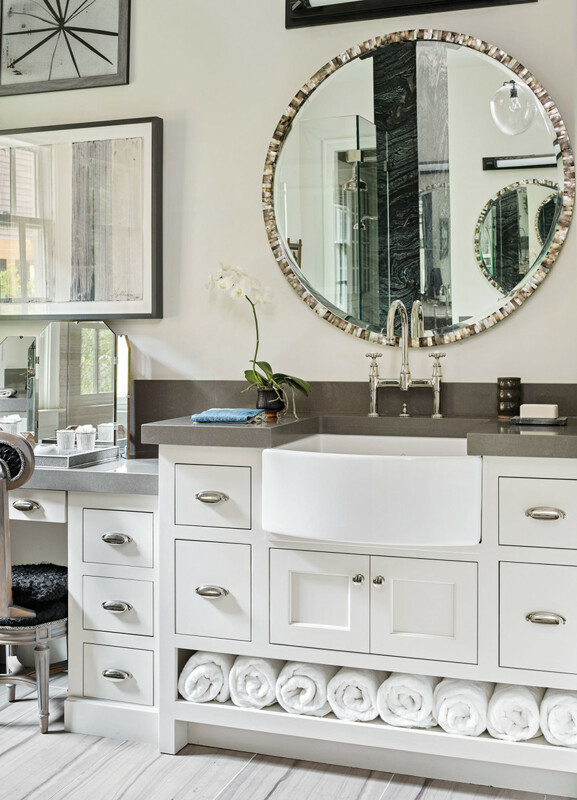 Generations of practical experience have shaped traditional forms and materials into an inventive variety of sinks, lavatories, and hardware, especially when spec’d for the house at hand by longtime suppliers. Sinks in early kitchens, for example, were site-made as simple wood or metal-lined basins, but once real plumbing trickled in they faced leaks and corrosion. Thick slabs of soapstone or slate, neither porous nor staining, performed better so in the 1890s plumbing purveyors offered pages of boxy stone sinks showing high backs and broad fronts not unlike their wooden kin. By the 1910s, however, hard-to-clean inside corners and joints reduced stone use to laundry tubs as homeowners sought seamless sinks with rounded corners and edges in solid ceramics, such as porcelain or earthenware. Solid ceramic kitchen sinks were all but washed away by cheaper porcelain-enameled cast-iron in the 1930s, but they resurfaced in the 1990s as a canny complement with period-style kitchens, especially from some original manufacturers “Founded in 1897, Shaws of Darwen, England is the originator of the farmhouse sink,” explains Greg Rohl, VP of marketing at ROHL LLC in Irvine, California, which introduced all-ceramic, fireclay sinks to the U.S. in 1997. “When these sinks were first designed, they were functional (for hospitals and health care institutions, due to the sanitary nature of the smooth glazes), but then became popular in the back-of-the-house butler’s areas and kitchens of fine, stately homes around the UK and America.” Rohl points to TVs Downton Abbey as an illustration, and says there’s a beautiful Shaws sink still in use in the 1914 Pittock Mansion in Portland, Oregon. 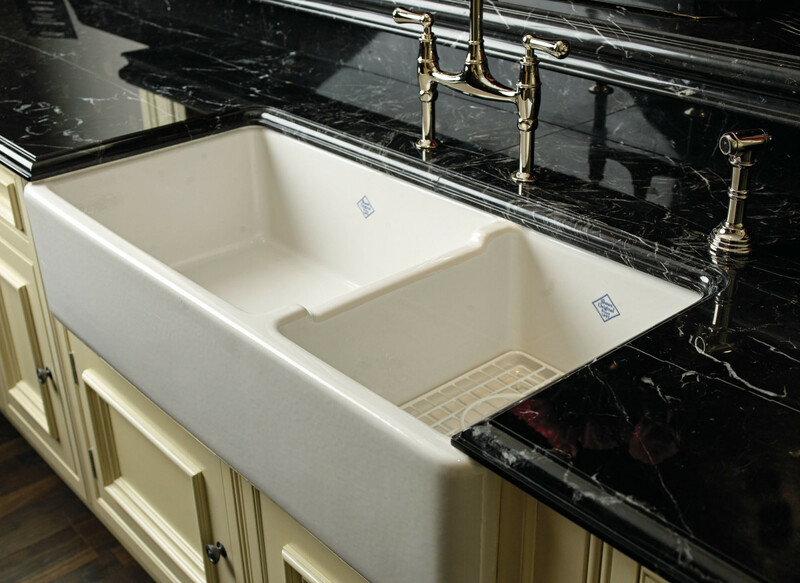 Casting solid fireclay makes possible a variety of seamless designs, such as this Shaws Egerton Casement Edge Front sink. 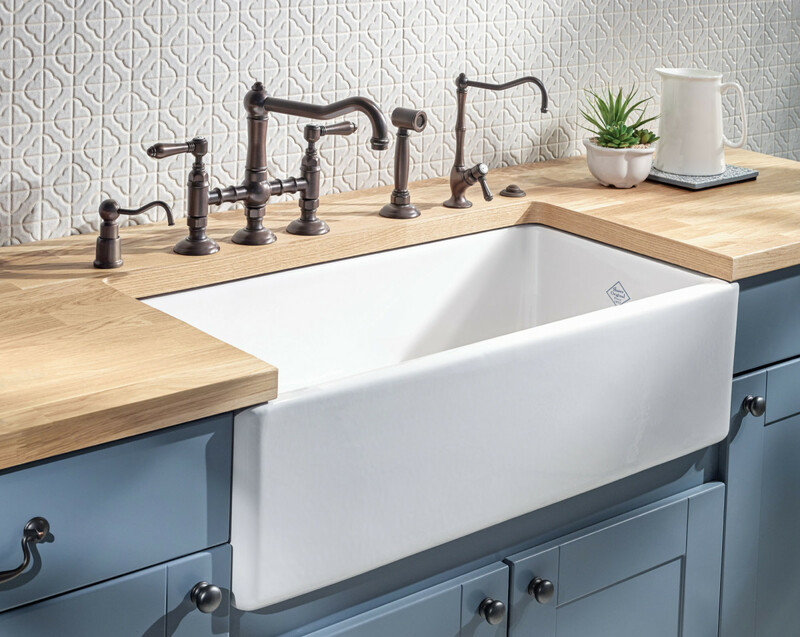 Unlike porcelain-coated sinks that expose underlying cast-iron when chipped, all Shaws Farmhouse Sinks are made from fireclay, which is heavy ball clay and glaze heated to extremely high temperatures until they fuse into a new material. 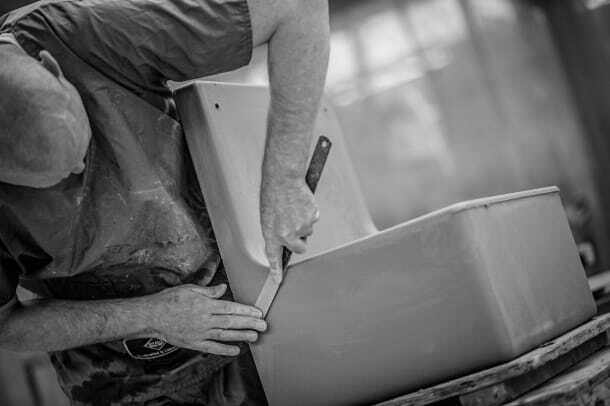 “It takes time to hand-make Shaws sinks,” says Rohl, “between three and four weeks in total.” Known as slip-casting, the process begins by pouring a mixture of locally sourced clay and water into porous molds. When the newly formed sinks are dry enough, they are removed, then hand-finished to a smooth surface though sponging and fettling to clean up mold marks. After applying two coats of glaze, the sinks are fired in specially designed kilns at over 1200 degrees Celsius, transforming the clay into fireclay, which resists cracking, chipping, and staining. Since each Shaws sink is made individually by hand, no two sinks are precisely alike and need to be inspected upon delivery as well as installed properly. 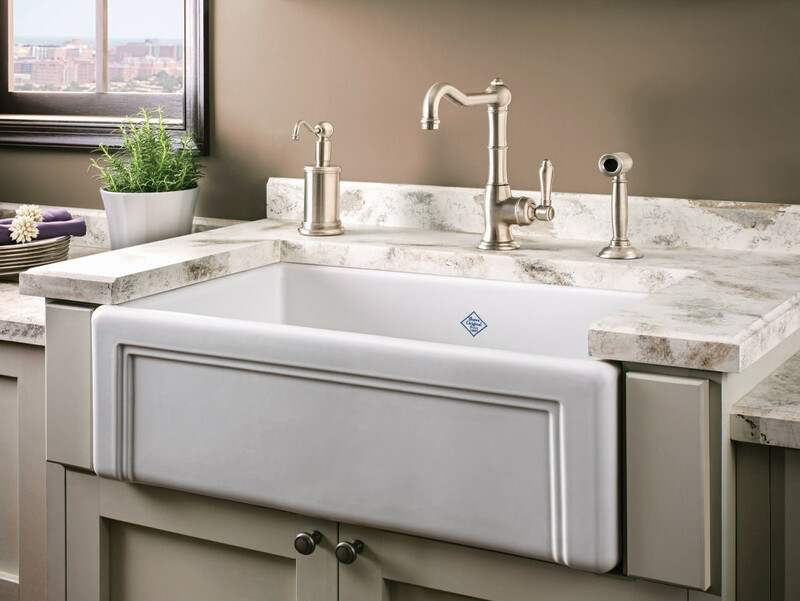 “The sides and top of the sink should be square within the 2 percent tolerance,” says Rohl, “and the installation should be for new construction only to hold a 190-lb. sink and water, with the support frame or base designed to support the sink on the sides and the back.” The sinks are made in one- and two-bowl versions, as well as a selection of traditional front styles, such as apron and bow, for applications from kitchens to pantries and more. 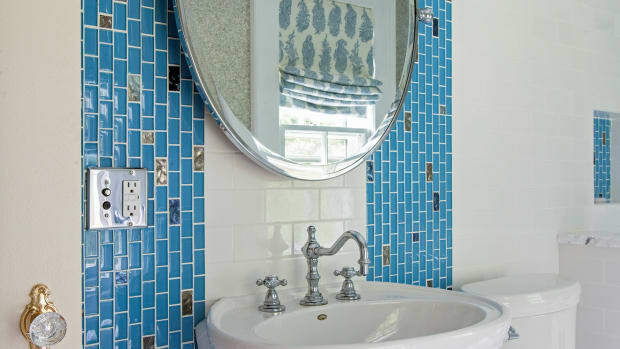 Bathrooms too are not the same without sinks—or more properly lavatories—and here ceramics have always held their own for beauty as well as utility. 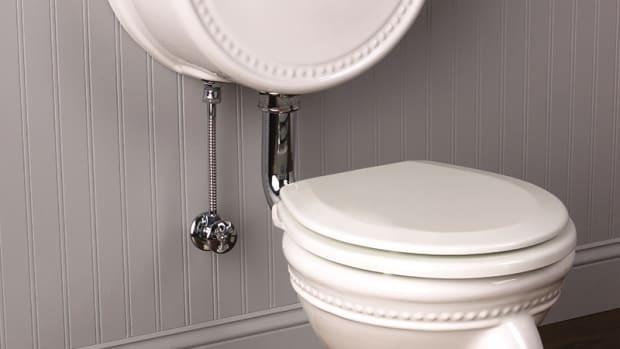 Whether called wash basins or simply bowls, porcelain versions in round or oval styles were common in plumbing fixture catalogs by the 1880s, and often adorned with artistic embossing on the outside or colorful bands on the inside. “We have over 20 different designs in our catalog,” reports Martin Gruber, manager at P.E. Guerin in New York, which has been making decorative hardware and plumbing parts since 1857, “but customers can also get their own designs made into the bowl.” He says the process starts with a sample tile made up for color that, when approved by the client, they send out to a ceramicist who does glazes for the company. Double-bowl sinks like this Shaws Rutherford 1-1/2 bowl are a traditional design to conserve water when washing and rinsing. 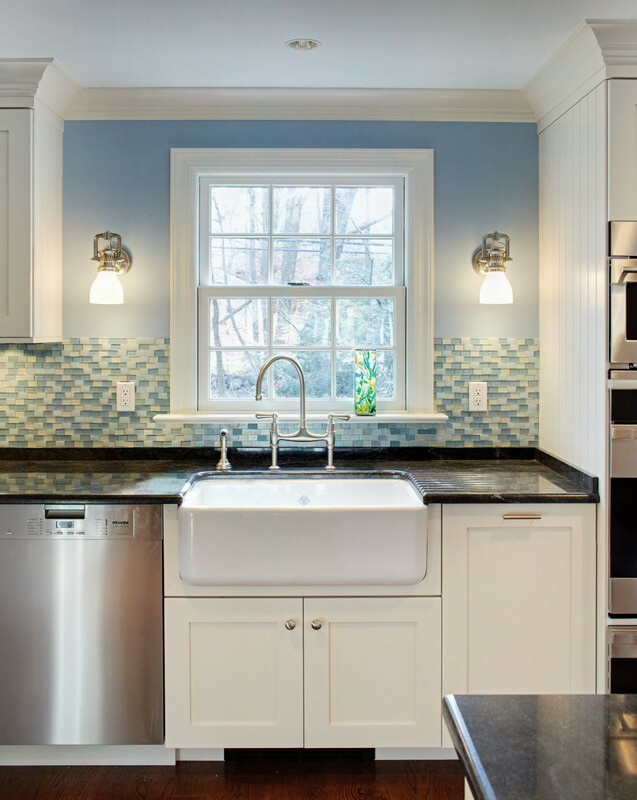 In the UK, apron-front Shaws sinks are at work in mansions and medicine alike. The term “Farmhouse” is an Americanism. Butler explains he also encourages staying away from pulls with sharp corners. “For example, sometimes people want to have pulls that look like twigs.” That’s not such a great idea he says because, in a kitchen, you’re constantly working up against the counter, moving back and forth while cooking or preparing. “If you have something sharp or protruding, that’s going to catch your apron or pants pocket and rip it.” This is less of a concern in other parts of the house, but in a kitchen there’s almost never-ending contact with the hardware. “You’d be surprised at how many people say, ‘Oh, but that piece is pretty,’ yet they’re looking at the hardware completely out of context. This elegant bathroom lavatory is, in reality, a bowed-front fireclay sink, proof positive of the sensual beauty of solid ceramics. He says they also do a lot of custom pieces for kitchens that are like pulls that get extended for the width or the length of a feature. 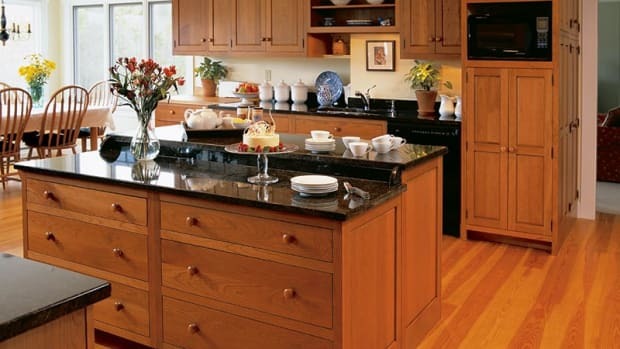 “Imagine you’ve got a whole kitchen full of drawers all over the place. We make the pulls so they’re long enough to be the full width of the drawer, and then as you go to the drawer next to that, the bar continues—except that it’s a separate bar at this point. So as you look across the entire length of the kitchen, basically you’ve got this railing that is the bar pull, but in multiple custom lengths that makes it all sort of run together.” The effect is almost like a railing. The pull becomes multipurpose: a place to hang a towel as well as to grasp.